Carrying an external battery pack is slowly becoming a mainstream thing – phones are getting bigger and users are slowly adopting them into their media consuming habits, so keeping a portable charger, or spare battery, is an idea that often pops up in one's mind. Samsung has been making such juiceboxes for a while now, and its newest addition adds a themed twist to the package – cute animal pictures. Now, now – not just any animals. 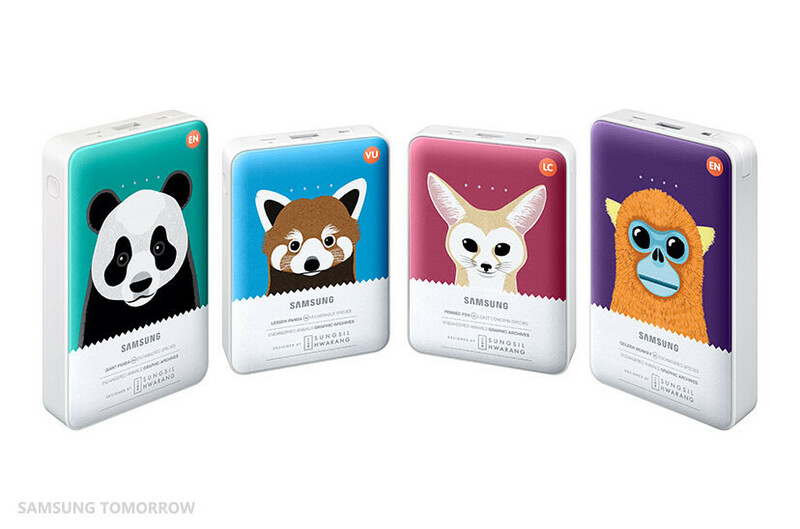 Sammy produced its new Animal Edition battery packs as part of its new “Charge the Life” initiative – an effort to remind us of a few endangered animals – the Fennec Fox, Giant Panda, Lesser Panda, and Golden Snub-nosed Monkey. So it's both a colorful battery pack, and an awareness-raiser. There is also a companion app up on the Play Store, which will show you an animated avatar of the animal of your choice that slowly changes its expressions as the phone's battery charge level goes up. You can actually grab the app and check it out without owning a battery pack, too. The portable rechargers come in 2 size variants – the lesser panda and the fennec fox models will have a 8,400 mAh capacity, while the giant panda and golden monkey ones will have 11,300 mAh worth of juice. OMG I want one jks.. what did just see? Samsung is love, Samsung is life. Charge the life. PA, you forgot to mention that for every battery sold, they will donate part of the sale to world's endangered animal societies. And also I believe there will be more than 4 animals. More animal series (40+ species) will be released later. Source? I just read "raise awareness", not "donate". Whether you like Samsung or not, this is actually a very admirable and well-executed campaign that feeds into their marketing. Charging your battery, "recharging" endangered species through charitable donation funded projects to bring up these species to a safe count; who either have their habitat wiped out or are poached by man.